I admit to being a total innocent when it comes to cars. I have never been interested in them beyond their ability to deliver you from A to B warm and dry. Motorcycles are more my thing. 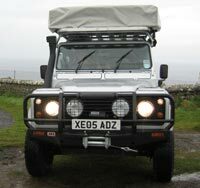 The vehicle is a 2005 110 Defender County station wagon to give it the full title. It has been extensively modified from the base vehicle to be able to cope with being a moving home to 4 kids and 2 adults. It also has to be robust and flexible enough to cruise on motorways yet sand, mud, dust and snow shouldn�t stop it. Using a Landrover as a base vehicle makes perfect sense. They have been around for so long now in one guise or another that everyone makes bits and pieces that bolt on with relative ease. I have felt a little self conscious driving the thing around Bath but this is not the natural habitat of a large 4X4. The mods are many and probably OTT but on this trip I do want to be totally prepared from the off rather than building something by trial and error on the way. I want time to enjoy the places and people we visit and meet. On board compressor & air tank. Some of the equipment we have brought with us has been excellent and other things could be better. Id just like to outline what I think has been useful, reliable, useless and maybe if I was preparing for a similar trip how I would do things differently. You always take too much and we have spent the last 6 months throwing things away. We now have a bit of spare space in the car! All the stuff I bought from Maplins. Head torches with LEDs at £6.99 as opposed to £40 for a Petzl. These have proved totally reliable and with their rechargeable batteries will go on forever. The only problem is that we have lost two out of our original five. One to a German dentist at the campsite at Eldoret and short of re-starting the Second World War and trying to strip search her she wasnt going to give it back even though the Askari (night guard) had seen her take it. She was an ugly munter anyway. The 240 volt inverter has also been very useful for recharging camera batteries and running the laptop etc. The compressor with air tank from Chris at BOAB (www.boab.biz) has proved invaluable for pumping up tyres when back on the tarmac after difficult stretches of dirt roads. I really thought that this was a bit OTT when preparing the car, but has proved itself time and time again. Though I might go for a bigger tank next time. The only reason why I can write this drivel! Good or bad depending on your point of view. 40 litres of pure heaven after a long day at the wheel to have an ice cold beer or a glass of freezing white wine from a colostomy bag the South African wine producers are so fond of. A brilliant bit of kit that will run on the auxiliary battery for three days without starting the engine in cool conditions and up to two days in hot countries. Keeps my supply of sausages cool and fresh and enables the kids to have ice cold water from our Sigg water bottles which are not very good as they are too easy to cross thread and can split if frozen. The local 2 litre coke bottles seem better! With a lid doubles as a potty on those hippo grazed campsites when a trip to the toilet is just a trip too far. Can be used in the day, at night and they remind everyone that someone at home loves them. please note Goldilocks youd be welcome any time. Just bring your own porridge please. Never enough left overs to store in our hungry family, but can be used for everything from collecting bugs to digging in the sand on beaches. I love my coffee and unlike David Beckham I dont keep ice cream and coffee in it. It keeps hot things hot and cold things cold, but not at the same time. 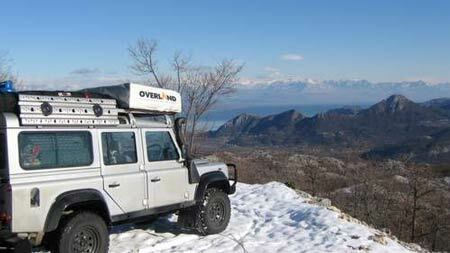 By Autohome, Italy (BOAB) is extremely comfortable and can sleep 4, but the mosquito nets have proved a little fragile. We have replaced the entrance one after many repairs with an African one impregnated with insecticide. Very waterproof. The cover has proved a little fiddly and not as strong as it should be. You can put this up in 30 seconds if you need to, but is heavy to lift onto the roof. Totally waterproof it also has strong and effective mosquito nets. 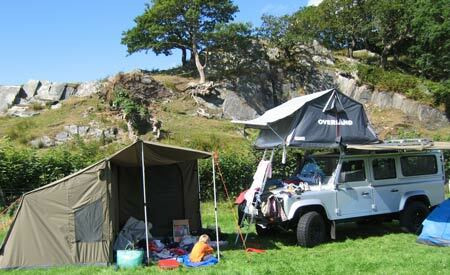 In retrospect I wish we had gone for two roof tents as Chris at Boab advised us. Sometimes you need to change your equipment to remain sane and I think we may well buy another roof tent in SA. cured by blowing everything out with compressed air and rough roads joggle everything around which means no IPOD on dirt roads. Camera is quite good, but with only a 3X zoom you have to be up an elephants bum to get a decent pic. A 15X zoom would probably be perfect. Ill let you know when I have a chance to edit the DV tapes when I get back to the UK although I have a feeling that most stuff will be too shaky to use! Very expensive argument saver, but seems to have stopped bloodshed when Clare navigates. Downloaded some tracks4africa software which has quite good info on it which means you kind of know where you arent, if you see what I mean. Technophobes like me may be better off with a partner who can read a map! I wish they would make one that talks to you in a Scottish accent, but that is enough of my fantasies for now. at least they then dont have to put up with completely useless companies like BT!! .Why do we need passports anyway, I know who I am! And unbreakable Curver blue storage boxes (now all broken) Id try to find decent boxes that can take the rough roads and rough handling. You could die of thirst waiting for this thing to filter water! I dont care what anyone says about flow rates etc etc this thing leaks everywhere and the aftersales service is appalling! This is all confirmed by other dissatisfied customers I have met on the way. A much better option is Nature-Pure water purifier from Footloose 4X4. .dont ask me why? Now relegated to storage space for the towrope etc. Absolute rubbish. No-one wants them and if they do the rates are rubbish. Mixture of Dollars, Pounds, Euros and cash advances on UK cashcard and Visa from ATMs are the answer. Never stayed up, absolute crap replaced with two single foam mattresses from Nakumat in Nairobi. Thermarests are brilliant and we will buy a couple when we arrive in SA. .OOWWWW THERES NO NEED TO PUNCH ME!!. warm and dry, rather than mud, sticky and wet. Great piece of kit although the solenoid has been playing up recently and only seems to work at a certain angle when held by a clothes peg in typical bodger fashion. Would consider 3 batteries as you can never have enough power! took 3 days for another vehicle to come past. After that I got a sump guard! From OEC, has broken twice, once in Ethiopia and once in Kenya. Has been modified so is now so strong could hold up the Forth Bridge. Probably a one off weak example. Very useful and as we carry a 20 litre jerry can of water as well we can generally get by with about 3 days bush camping without filling up. Dont forget a length of hosepipe long enough to get from a tap to the filler. 12 foot is perfect. They decide to test this and each of them gets a cat and locks them into their vehicles overnight. The next morning they go and have a look and open the Toyotas door to find that the cat has died due to lack of oxygen, next they go over to the defender to find that the cat has escaped overnight! Seriously though, the aircon really is good on dusty roads as you can turn it on and keep most of the dust on the outside. I guess the only complaint about it is that it takes up a lot of leg room on a defender and it is not totally effective in very hot conditions. The theory is that silver would reflect a lot of heat, but I havent had a black defender to compare it with.